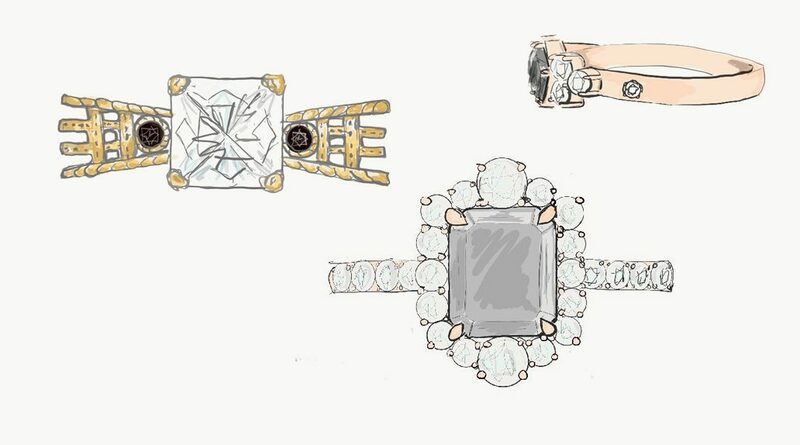 Last year I showed you how Abby Sparks reimagined heirloom rings from a client by using its Diamonds to create a new ring with them, the Lisa ring. The Abby Sparks-team now uses a new design process. 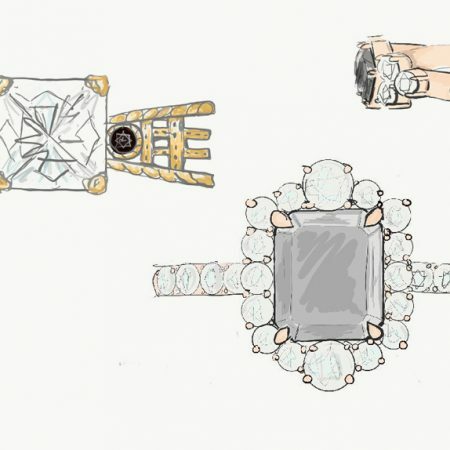 They have recently started to design their jewelry with iPads! Modern right? The sketches look absolutely beautiful and they are all done by their in-house designers. Take a look at them by yourself! 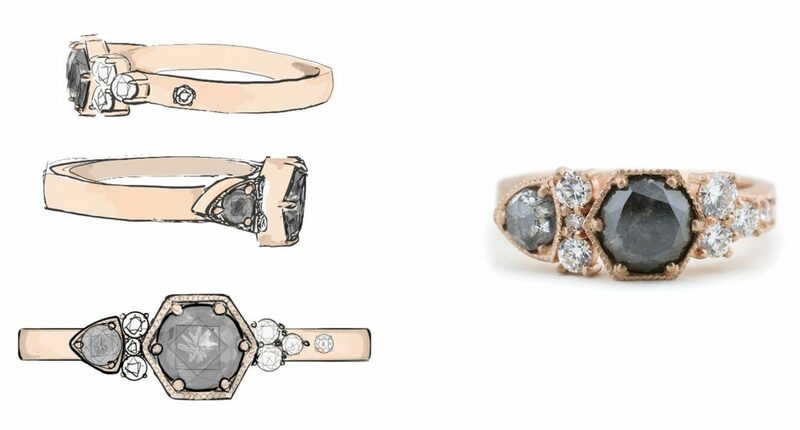 The Caitee ring, as per usual all custom rings are named after their wearers, is a Rose Cut Grey Diamond engagement ring custom made for a beautiful couple. The Caitee features an emerald shaped rough diamond surrounded by a round diamond halo set close in to the center stone. 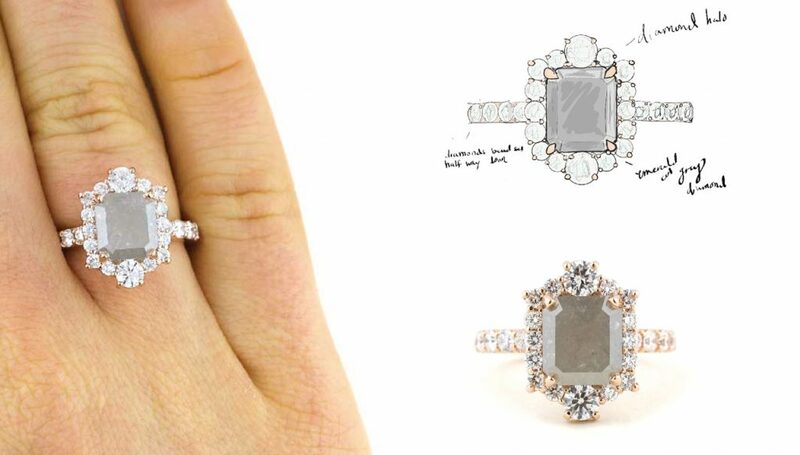 Two slightly larger diamond accents dot the North and South points give an elongated shape to the overall design. High polish rose gold is barely visible from the top view, but provide a slight pop of color contrasting with the moody colored rough diamond. 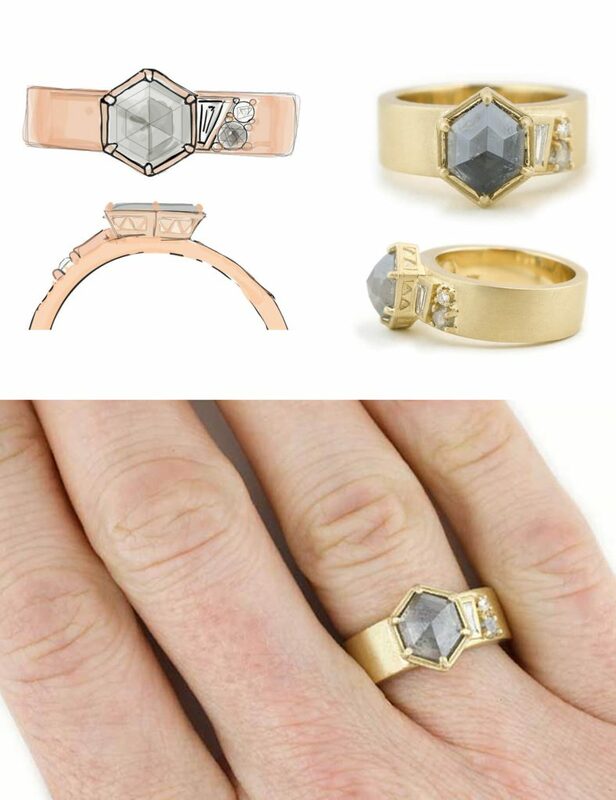 This modern engagement ring, named the Leah Kay ring, features a Rose Cut Hexagon wide band set with rose cut grey diamond hexagon center stone along with an asymmetric tapered baguette and is hugged by one grey and one white round diamond accent stone. The overall design is low profile, with hand carved triangle details visible from the profile view. 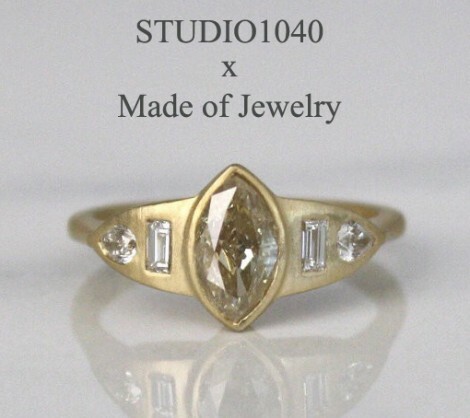 A truly gorgeous ring which is doing tricks on you with its milgrain Hexagon setting but holding a round Grey Diamond center stone. 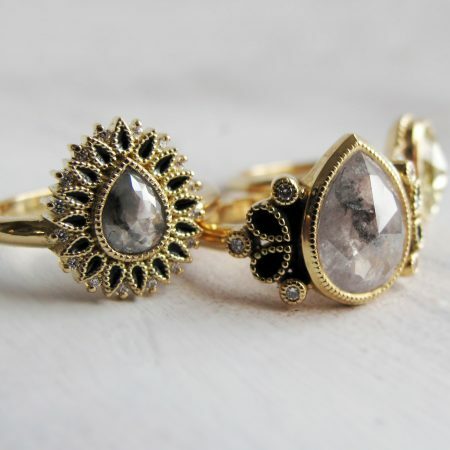 The Mandi ring is also set with round brilliant cut diamonds are clustered asymmetrically on either side, with one more rough diamond set in a trillion shape followed by a small white diamond bead set in the brushed matte rose gold band. This Cheryl Twist engagement ring features a lighthouse motif using a filigree pattern and nautical braided ropes on the band. The coast holds a special place in the couple’s hearts, and symbolizing the safe haven of a lighthouse was important to both. 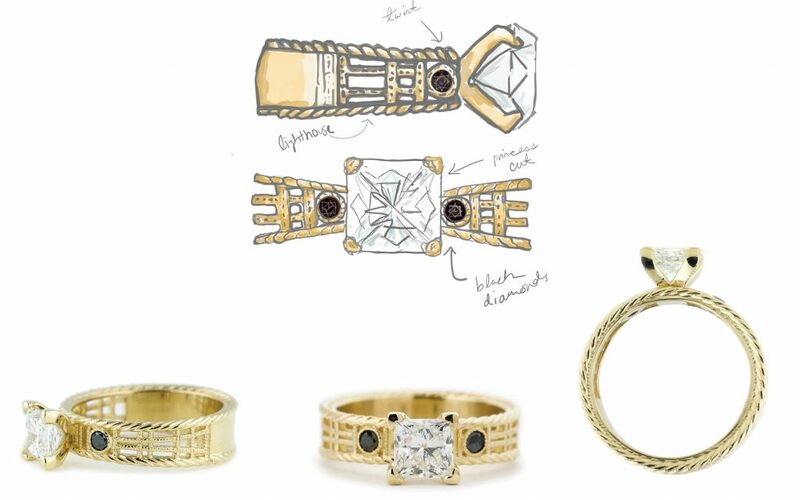 A princess cut diamond tops off the yellow gold engagement ring, and black diamond accent stones dot either side of the center stone. 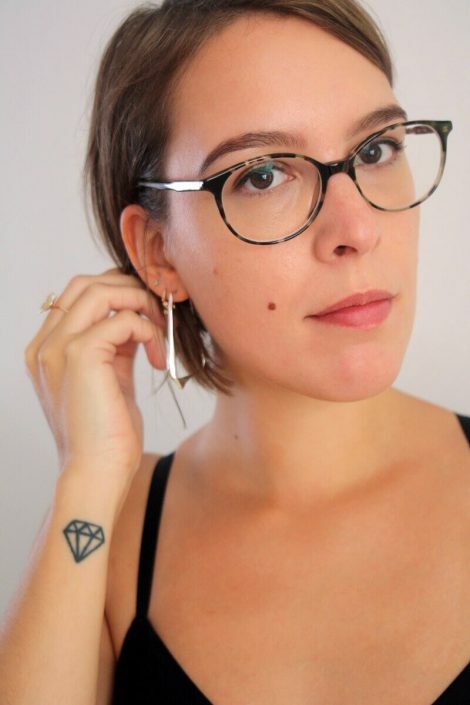 It’s definitely a very unique design. Bonjour beautiful! The Meri ring is a nature-inspired beauty made for a nature-loving, flower arranging, Denver Botanical Gardens volunteer. 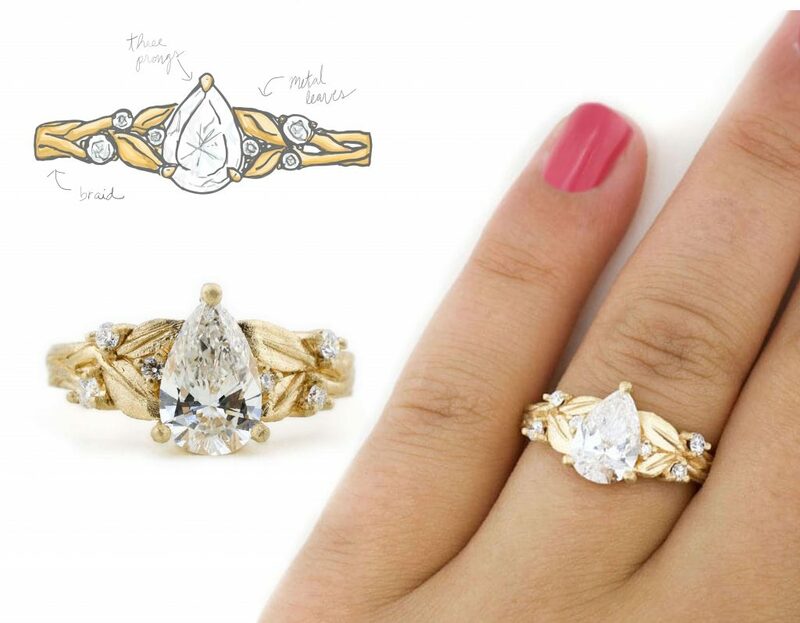 This nature-themed custom engagement ring has an engraved leaf design around the vine-like yellow gold band, with a hint of vintage flair. The pear-shaped center stone is an earth-friendly lab-grown diamond, with asymmetrically set round diamond accents between the leaves.